Asbestos-related diseases are believed to claim the lives of between 12,000 and 15,000 people each year, according to the Environmental Working Group. Different types of asbestos were once widely used in construction, manufacturing and other industries. 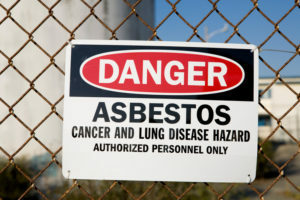 Although the health risks of asbestos exposure—which include mesothelioma and other forms of cancer—are well known today, asbestos was used throughout most of the 20th century in a diverse range of industries and products. Because the symptoms of asbestos-caused illnesses typically take decades to manifest, many who were exposed to asbestos when it was routinely employed in construction, manufacturing and other occupations are only now experiencing its effects. Serpentine: Chrysotile is the only asbestos member of the serpentine mineral family, but this so-called “white asbestos” has been used more widely than any other type of asbestos; serpentine minerals are distinguished in part by their curly fibers. Amphibole: The amphibole class includes five types of asbestos, which are characterized by their needle-like fibers. 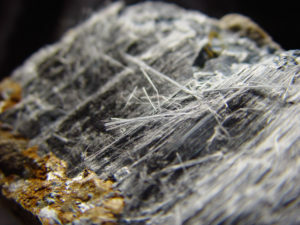 The fibers of each asbestos mineral type are composed of microscopic fibrils, which are released when the asbestos-containing material is broken down. These fibrils may in turn be inhaled and accumulate in the lungs, where they trigger the cell mutations that lead to mesothelioma and lung cancer. Each asbestos mineral type is carcinogenic. These forms of asbestos differ somewhat in their composition and application, although they generally share properties of heat and electrical resistance, and they bond easily with other materials. Some types of asbestos have been used commercially, while others have been used as additives to industrial goods. Chrysotile asbestos, shown here in its mineral form, is the most commonly used type of asbestos. Although it is the only type of asbestos in the serpentine class, chrysotile asbestos is believed to account for 90 to 95 percent of all asbestos use. Studies indicate that chrysotile asbestos has been linked to more cases of mesothelioma than any amphibole asbestos minerals. Actinolite asbestos can also be found in vermiculite and talc. 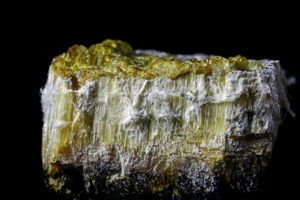 Though its use wasn’t as widespread as other types of asbestos, actinolite asbestos breaks down into incredibly tiny fibers that are easily inhaled and can contribute to mesothelioma and lung cancer. Amosite asbestos is a common source of mesothelioma and other forms of asbestos-related cancer thanks to its popularity and the inhalable nature of its fibers when broken apart. A relatively rare form of asbestos, anthophyllite’s use has been mostly limited to a few cement products and insulation materials. Still, the long, acute fibers of this brownish or yellowish asbestos pose severe health risks when inhaled. Crocidolite asbestos, aka “blue asbestos,” was used in the manufacture of pipe insulation, tiles and some cement products. Crocidolite asbestos is also referred to as “blue asbestos” because its fine, sharp fibers have a bluish hue when viewed under a microscope. Crocidolite is one of the most hazardous types of asbestos, although its use was limited compared with chrysotile asbestos because it is not as heat-resistant. Crocidolite was primarily used in pipe insulation, tiles and some cement products. Research into environmental exposure to crocidolite suggests that, per capita, crocidolite may be responsible for more illnesses and deaths than any other form of asbestos. Like some other types of asbestos, tremolite is found in other minerals including vermiculite and talc. Though tremolite was not commonly used, it was added to a range of goods including: paint, sealants, insulation, roofing and plumbing materials. New York attorney Joseph P. Williams understands the life-changing impacts of mesothelioma and other asbestos-related diseases. The Williams Law Firm is dedicated to helping asbestos exposure victims and their families recover the financial security they need to cope with medical costs and other expenses. If you or a loved one was diagnosed with mesothelioma, please call us today at 855-575-MESO (6376) or contact us online. We offer free consultations to help you understand your options, and we don’t charge for our services unless we recover on your behalf. Though we’re based in New York, The Williams Law Firm works with clients nationwide. We are able to visit with you via video conference or in the comfort of your home.